Welcome to Canada Quality Machine Shop. We supply high quality cutting tools, measuring tools, machine tool accessories, etc. At very good price from Toronto, Canada. All items are guaranteed to your satisfaction. 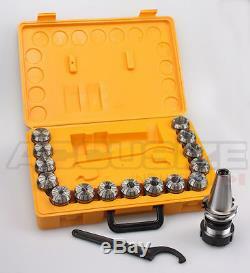 BT40 Shank + 15 PCS/Set ER40 Collet Set + Wrench in Fitted Strong Box, Dynamic Balancing Grade G6.3/12000 RPM, #BT40-ER40. 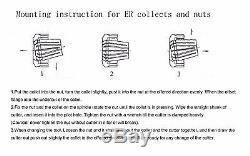 15pc ER40 chucks set includes the following collet sizes: 1/8, 3/16, 1/4, 5/16, 3/8, 7/16, 1/2, 9/16, 5/8, 11/16, 3/4, 13/16, 7/8, 15/16, and 1'. 1 PCNER + 1PC CLAMPING NUT. New: A brand-new, unused, unopened, and undamaged item in its original packaging (where packaging is applicable). Should you have any question please feel free to call 647 931 2564 or 647 933 1588. We will choose between couriers unless you indicate a preferred method. Our HST number is available upon request. The item "BT40 Shank + 15 Pcs ER40 Collet Set + Wrench in Fitted Strong Box, #BT40-ER40" is in sale since Thursday, January 15, 2015. This item is in the category "Business & Industrial\Manufacturing & Metalworking\Metalworking Tooling\Workholding\Collets".